ONE of the most interesting machines which we have had the opportunity of seeing is now nearing completion at the Bleriot Works at Addlestone. The machine referred to is the ДальшеMore>>> new Handasyde monoplane, designed by Mr. G. H. Handasyde, of the Handasyde Aircraft Company, for Australia. Being at the moment without works for manufacturing aircraft, the Handasyde Aircraft Co. have made arrangements with Mr. Chereau for the construction of a batch of these machines at the Bleriot Works, and here we had the opportunity of inspecting the machines last week for the purpose of compiling the following notes, and obtaining the accompanying illustrations. It should be pointed out that, at the time of our visit, no drawings were available of the engine cowling and undercarriage. Although as regards general lay-out the accompanying scale drawings are accurate, the portion relating to these two items should be taken as representing the general idea only, and is not guaranteed to be exact as regards dimensions, as we were unable to obtain certain necessary information relating to wheel track, size of wheels, etc. For the rest, however, the scale drawings on p. 413 may be taken as being accurate. To those who have followed the development of flying since its earliest days it will not come as a surprise that the new H.A.C. machine is a monoplane. From the very first Mr. Handasyde was a great believer in the monoplane, and it will be remembered that his early machines, round about 1911, 12 and 13, were of this type. During the War Mr. Handasyde turned his attention to biplanes, not because he had lost his faith in the mono., but as a result of the demands of the R.A.F. He proved that he was quite as capable of designing biplanes as monoplanes, and probably his F.4 is the most beautiful aeroplane that has ever been produced. It must be admitted that, purely as regards appearance, the new monoplane is not up to the F.4, but probably this was impossible of attainment in a monoplane type. The new machine, which is of the cantilever type, is characterised, in the matter of construction, by being built almost entirely of wood. Metal is used very sparingly in the construction, and the manner in which the wood has been used is everywhere interesting and, in places, highly ingenious. The middle portion of the fuselage is devoted to cabin accommodation for the passengers. Normally, seats will be provided for six passengers in the cabin, but should it be desired to use the machine for goods carrying the space available is reasonably large, and even bulky goods could be carried, provided the packages were small enough to go through the doors. Of these there is one on each side, near the front of the cabin, and three windows on each side, aft of the doors, serve to admit the light. An emergency exit through the roof of the cabin is provided. This takes the form of a box of three-ply wood, built on to the roof and projecting up inside a cut-out portion in the trailing edge of the wing. On top this exit is covered with a hinged trap door of sheet aluminium, provided with louvres for the ventilation of the cabin. Aft of the cabin is a lavatory, while in front, under the pilot's seat, is a space for luggage. Placed as it is in front of the wing, and with the nose of the fuselage fairly pointed, the position of the pilot's cockpit should ensure a very good view forward, which is a point not always given due consideration by designers. In the H.2 the pilot is placed high, his head level with the leading edge of the wing, out of which a portion has been cut to accommodate him. The front portion of the cockpit is formed by a deep three-ply fairing built on to the top of the fuselage proper. The controls will be of more or less standard type, as will also the equipment of instruments, etc. At present a batch of four machines is coming through the Bleriot Works, and it is understood that they are intended for the Larkin Company in Australia, for service on the Brisbane-Sydney-Adelaide route. The addition of such very up-to-date flying stock to these services should materially help towards establishing commercial aviation on a sound basis in Australia. As regards weights, performance figures, etc., we have not at present been able to obtain any information, but there would appear to be every reason to think that, with its good wing sections and a well-shaped body, the new Handasyde monoplane will be fairly fast, especially as the fitting of a Rolls-Royce "Eagle" for but six passengers should result in a fairly large reserve of power. A little later, when the first machine has been tested, we hope to be able to supplement this description with further details and with figures of weights and performance. The Handasyde H.2 Commercial Monoplane: This machine, a full description of which was published in our issue of July 20, 1922, has been undergoing tests recently at Brooklands. It is intended for service in Australia, and is fitted with a Rolls-Royce "Eagle" engine. 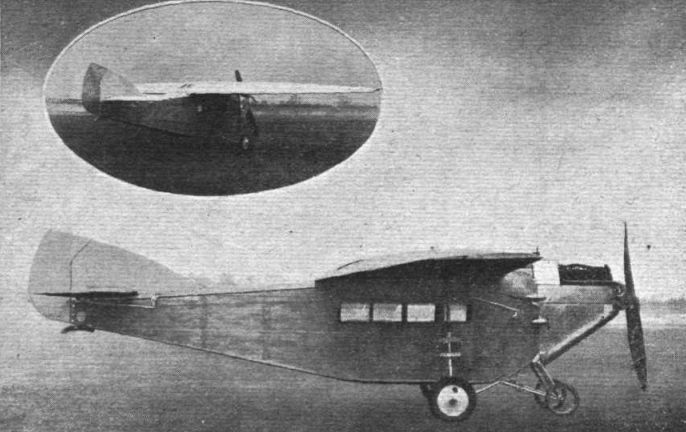 Side view of the Handasyde Cantilever Monoplane with "Eagle IX" engines. 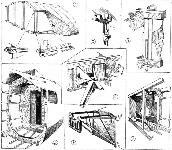 SOME CONSTRUCTIONAL DETAILS OF THE H.A.C. MONOPLANE: 1. Rib at root of wing, with fittings for joining two halves together. Eight bolts, four on top and four underneath, secure the two wing halves. 2. The wing spars are secured to the fuselage hoops by a form of turnbuckles. 3. Steel strips running up the side of the wing spars transmit the load from the lift fittings. 4. A crank lever in the aileron system. 5. View into cabin portion of fuselage. Wall broken away to show details. 6. The engine mounting is of great simplicity, and allows free access to any part of the Rolls "Eagle." 7. The construction of the rear portion of the fuselage, in the vicinity of the tail trimming gear. THE H.A.C. 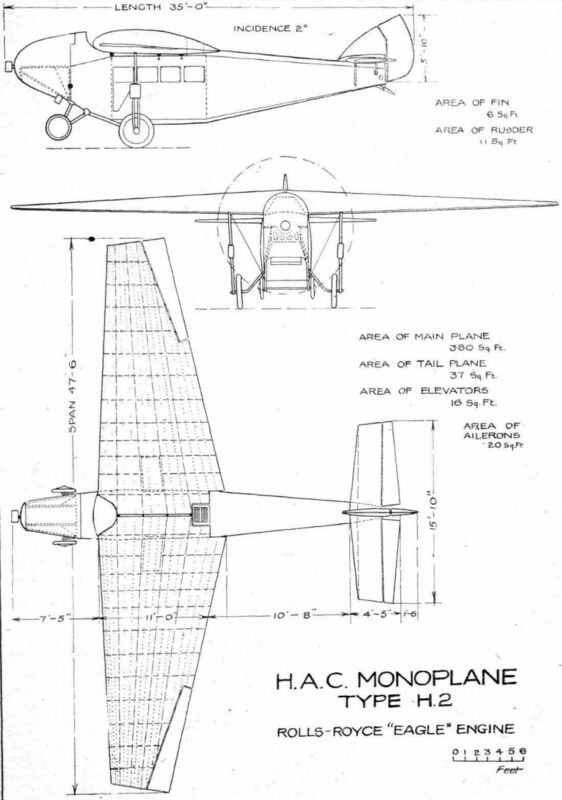 MONOPLANE: Some constructional details. 1. Diagrammatic perspective sketch of the general arrangement of the wing. 2. 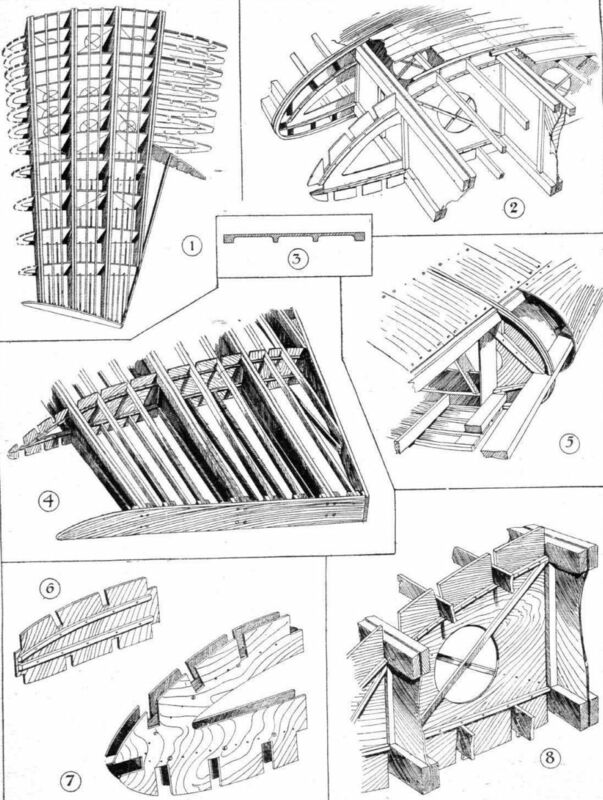 Details of spar and rib construction. 3. Section through a spruce strip used for the wing covering. 4. The raked rib of the wing tip. 5. Details of leading edge, which is covered with thin three-ply wood. 6. Piece of three-ply rib web, as fitted between spars. 7. Nose-piece of a double rib. 8. 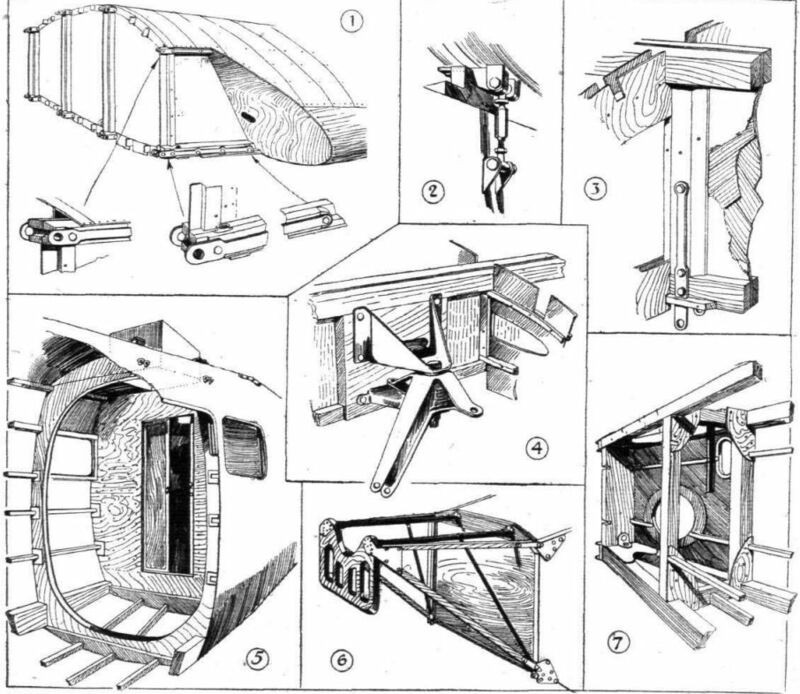 Larger view of method of building up spars and ribs.